When her mother returns to work, half-Chinese and half-Irish Emma gets babysat by her Aunt Gracie. The aunt, who comes from the Chinese side of the family, is a fount of Chinese culture and obviously disapproves of how Americanized (and Westernized) her niece is becoming. To rectify this situation, she devotes the day to exposing Emma to her Chinese roots. This begins with Aunt Gracie giving Emma a rag doll with black hair and almond eyes to replace the rather more traditional rag doll given her by the Irish side of the family. During the day introduces Emma to the joys of chopsticks (useful for eating the marshmallows in Lucky Charms! ), making wontons, and playing mahjong. This part of the story follows fairly traditional ground of introducing an initially reluctant child to new things and simultaneously exposing the reader to some cultural diversity. However, the story has much broader ambitions. 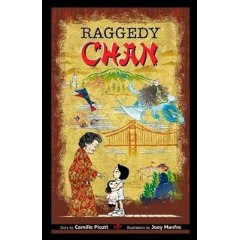 Auntie Gracie also shares a story with Emma about Raggedy Chan (her new doll), who is actually a Chinese princess named Yao-chi. When the benevolent and rain-making Winged Dragon is stolen from her lands by the demon Drought Fury, the princess must cross the ocean to the land of the Jung-wu (America) where she befriends Paul Bunyun and Babe, who help her with the rescue. At this point, the story probably sounds a bit like a merger of Princess Bride with The Joy-Luck Club, but Picott's ambitions go further still as the fairy tale (and even Aunt Gracie's culture lessons) become an overall story about the Chinese-immigrant experience, racism, and the pain of leaving home. The result is an unusual book that is hard to categorize into a convenient niche. The story is complex and multi-layered. At times, it is a bit hard to follow and young readers might get distracted. The mixtures of culture and themes struck me as a particularly Californian viewpoint of the world and readers in other regions might have trouble understanding how it all fits together. I found myself admiring the ambition of the work more than the actual result. There really are at least two (if not three) separate stories in this book and I wanted more focus, especially in a book which is probably intended for younger readers. As an unrealted issue, more sensitive younger readers might find some of the scenes (eyes being gouged out, skin being flayed) a bit too intense, or at the very least confusing. I haven't yet mentioned the illustrations by Joey Manfre, but they deserve special note. The styles are a bit diverse (sometimes Disneyesque, sometimes quite abstract) but the artwork is consistently vibrant and interesting. Given the story's iconoclast nature, the drawings are quite appropriate and added greatly to the experience of reading the book.